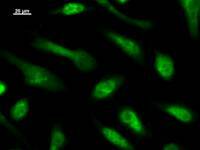 NFYB antibody LS-C342345 is an unconjugated mouse monoclonal antibody to human NFYB. Validated for DB, ICC, IF and WB. Immunostaining analysis in HeLa cells. HeLa cells were fixed with 4% paraformaldehyde and permeabilized with 0.1% Triton X-100 in PBS. The cells were immunostained with anti-NFYB mAb. 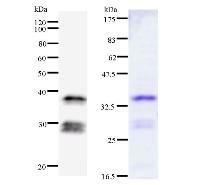 Left : Western blot analysis of immunized recombinant protein, using anti-NFYB monoclonal antibody. Right : CBB staining of immunized recombinant protein.